Cheap Flights to Wellington, New Zealand. Return Flights. 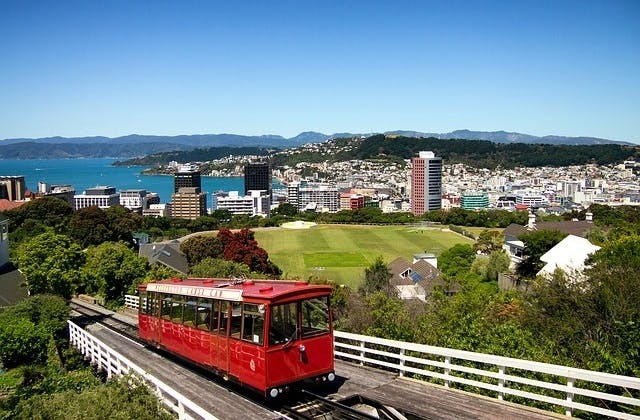 Wellington is the cultural jewel of New Zealand and its capital city. It lies situated on the breathtaking southwestern tip of New Zealand's beautiful North Island and boasts lovely beaches, great dining and shopping opportunities. Some of New Zealand's best cultural institutions and museums can be experienced on walking tours through Wellington's historic architecture. They range from such notable institutions as the Museum of New Zealand, Cable Car Museum to the Wellington City Art Gallery. And special exhibits coincide with the many art, theater and music festivals each year. Great food and wine is another hallmark of the hospitality atmosphere of Wellington. The caf' culture features cuisine choices from around the world as well as local New Zealand style favorites. The cheapest airfare to Wellington is $232 leaving from Brisbane. The closest overseas airport to Wellington is Norfolk Island in Australia. It is roughly 1,498 km . The Airport Motor Lodge is conveniently located to Wellington airport. 19 airlines operate to Wellington. They include LATAM Airlines, Emirates, British Airways, Singapore Airlines, ANA, Qantas Airways, Philippine Airlines plus more. @onetwtuser @BigJetTVLIVE @British_Airways These guys need to watch flights coming into Wellington! @lufc2510 @ML87_ Just looking on Skyscanner for flights to Wellington as we speak ? ?